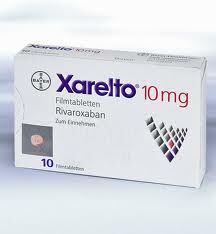 Xarelto, a blood thinner, is used to prevent the formation of blood clots, important for prevention of strokes and heart attacks. Like Pradaxa, it was intended to replace Warfarin (Coumadin). It has been promoted as superior to Warfarin and others like it, because it is easier to take and requires less frequent monitoring to maintain the correct dose. A huge deal, I’m sure, to patients who can better fit their clotting medication in with their lives. A major issue with the new class of blood thinners is that there is currently no antidote available for these medications. Unlike Warfarin, where doctors are able to administer a dose of vitamin K and plasma to reverse any bleeding problems, there is no such antidote with Xarelto or Pradaxa. With its introduction in October 2010, Pradaxa quickly became one of the drugs most commonly associated with adverse event reports submitted to the FDA. Boehringer Ingelheim, makers of Pradaxa, currently face hundreds of lawsuits filed by or on behalf of former users, alleging that the drug maker failed to adequately warn about the risk of uncontrollable bleeding or the lack of an available reversal agent to stop bleeding problems that may develop. Xarelto, which generated $425 million in sales last year, and has nearly reached the half billion mark this year, still claims to have benefits that outweigh the others. How long before the claims against Xarelto start to reach numbers like Pradaxa is seeing is anyone’s guess. My best guess? Not long. If you are still taking Xarelto… we are not doctors and we can’t know the cost benefit analysis that applies to you and what drug you should take. But you absolutely should be raising these questions to your doctor bout the risks and benefits of taking the drug. If you believe you may have a Xarelto claim, it is important for you to contact the FDA through MedWatch to report the problems that you have had with the drug. These reports will help the FDA to determine whether a Xarelto recall is necessary. Contact our Xarelto attorneys at 1-800-553-8082, or get a free online evaluation of your potential Xarelto injury or wrongful death claim. Xarelto Problems: Lawsuits on the Way?